Being the leader is a tough job. You definitely have a lot of work cut out for you if you plan on stepping into the role of Robin from the Teen Titans. He's in charge of the whole operation, which means keeping the rest of the Titans in line when it's time to fight the bad guys. That means he needs to keep Beast Boy on task, even when it's video game night. He also needs to make sure Starfire understands Earth's ways, since most of the time she has no clue what's going on. He also needs to make sure that Raven doesn't just lock herself up in her room all day, as she's been known to do. That's a tall order to fill, but we think you can handle it! It's time to prepare yourself! Break out the bo-staff. Brush up on your martial arts skills. Make sure to do a bit of manager training, because you're about to step into the role of the leader of the Teen Titans with this Robin costume! 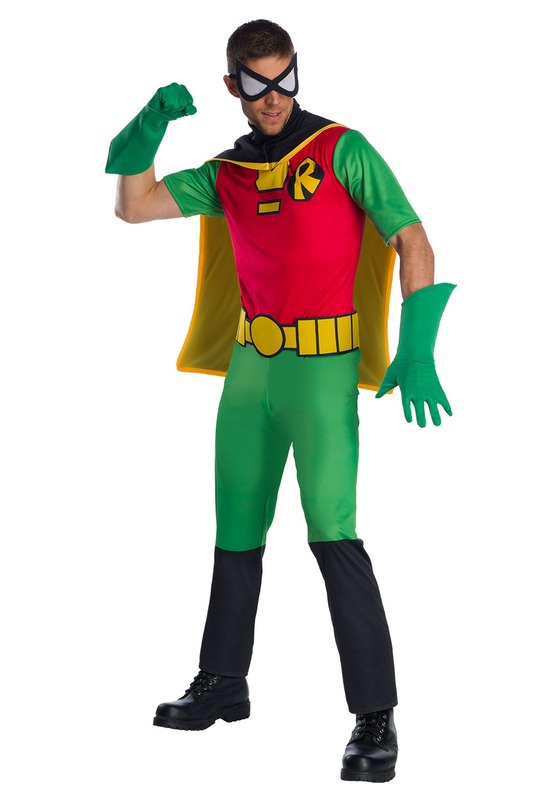 Officially licensed from the DC show, this Teen Titans Robin costume comes with everything you need (aside from years of training with Batman) to become a superhero. The costume comes with a full-body jumpsuit designed to look like the one seen in cartoon series. It comes with a faux utility belt around the waist, a printed "R" on the front, and a cape. The mask will help you protect your secret identity and the gloves add the finishing touch to the costume. Don't go thinking that you can fight Slade when you dress up in this costume unless you've been honing your karate skills like a champ! This Teen Titan costume will have you feeling like a hero, but it's no substitute for some training with Batman. Maybe you could give him a ring for an impromptu crime fighting lesson!